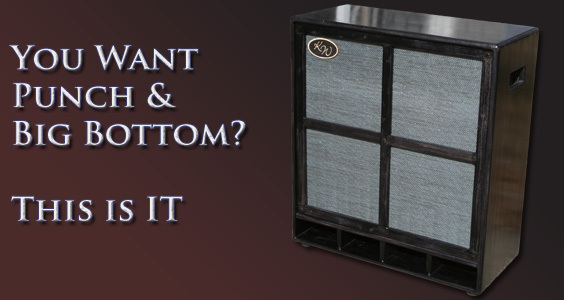 Is a 4x10 your favorite bass cabinet? Looking for that snap and punch, but don't want to sacrifice thump? Then this is the ultimate 4x10 for you! Delicious articulation and detail but with tremendous depth and warmth rarely heard these days. The SB-410 is lightweight at only 60lbs, but delivers tremendous sound. It handles Extreme Power with Faital Pro brand drivers handling 1200 watts! Both of these configurations deliver terrific high end response without the need of a horn driver; which yields an incredibly organic tone that sounds extremely natural. However, our variable high frequency driver is also available for those who desire extreme HF range. This is the last 4x10 you'll ever need, and for the ultimate configuration mate it with our SB-115 for even deeper response.